Pericarditis : Acute inflammation of the pericardium characteristically produces chest pain, low grade fever, and a pericardial friction rub. Pericarditis and myocarditis commonly co-exist. • Myocardial infarction (including Dressler’s syndrome). • Viral (Coxsackie A9, B1-4, Echo 8, mumps, EBV, CMV, varicella, HIV, rubella, Parvo B19). • Bacterial (pneumococcus, meningococcus, Chlamydia , gonorrhoea, Haemophilus ). • Locally invasive carcinoma (eg bronchus or breast). • Collagen vascular disease (SLE, polyarteritis nodosa, rheumatoid arthritis). • After cardiac surgery or radiotherapy. • Drugs (hydralazine, procainamide, methyldopa, minoxidil). Classical features of acute pericarditis are pericardial pain, a friction rub and concordant ST elevation on ECG. The characteristic combination of clinical presentation and ECG changes often results in a definite diagnosis. Chest pain is typically sharp, central, retrosternal, and worse on deep inspiration, change in position, exercise, and swallowing. A large pericardial effusion may cause dysphagia by compressing the oesophagus. A pericardial friction rub is often intermittent, positional, and elusive. It tends to be louder during inspiration, and may be heard in both systole and diastole. Low grade fever is common. Obtain blood cultures if there is evidence of sepsis or suspicion of a bacterial cause (eg spread of intrathoracic infection). scanning: clinical evidence of cardiac tamponade is rare. and present in at least 2 limb leads and all chest leads (most marked in V 3–6 ). T waves are initially prominent, upright, and peaked, becoming flattened or inverted over several days. 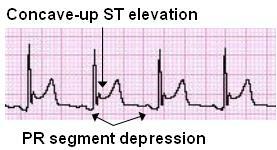 PR depression (reflecting atrial inflammation) may occur in the same leads as ST elevation (this PR–ST discordance is characteristic). Pathological Q waves are not present. Pericardial effusion causes d QRS amplitude in all leads. Electrical alternans is diagnostic, but rare. Refer to the medical team for echocardiography and treatment. The appropriate treatment depends on the underlying cause. Idiopathic pericarditis or viral pericarditis in young patients is usually benign and self-limiting, responding to symptomatic treatment (high dose NSAID ± PPI cover). Occasionally, it follows a relapsing course before ‘burning itself out’. Dressler’s syndrome (autoimmune pericarditis ± effusion 2–14 weeks after 3 % of MIs) requires cardiology specialist care. Pericardial effusion may occur with any type of pericarditis. It is relatively common in acute bacterial, tuberculous, and malignant pericarditis.